The first bug Daniella Martin can remember crunching down on was a chapuline (aka a toasted, chile-spiced grasshopper) in Oaxaca, Mexico. Fast forward eight years, though, and she’s downed hornet larva in Japan, launched a bug-cooking show and authored Edible: An Adventure into the World of Eating Insects (Feb. 11; Amazon Publishing). In her spare time, she enjoys whipping up Hakuna Frittata, made with mushroom, egg and moth larvae; Spider Rolls made of tempura-fried tarantula with cucumber and avocado; and Bee-LTs, made with the usual ingredients, plus sautéed bee larvae. You could say she’s on the up and up when it comes to bug-based cuisine. Most Americans, however, are not. That said, you might be surprised to find that dozens of places around the nation are serving up creepy crawlers. From creative food carts, to insect-devoted museums to high-end eateries. There are even festivals focusing on the consumption of insects, also known as entomophagy. In fact, more than 33,000 people attended BugFest in Raleigh, N.C., in September. And in November when the Audubon Butterfly Garden and Insectarium in New Orleans hosted it’s annual Hoppy Thanksgiving event, more than 1,300 people showed. (The menu included turkey with cornbread and mealworm stuffing, wax worm cranberry sauce and cricket pumpkin pie.) What’s even more remarkable is that on a busy week, they go through 10,000 bugs. For Monica Martinez, owner of Don Bugito, a street cart in San Francisco, it’s a no-brainer. The 38-year-old artist and chef from Mexico City, where people have been feasting on buggy cuisine since the Aztec Empire, became fascinated with sustainable food systems when she moved to San Francisco. So she launched the food cart in 2011 to introduce people in the Bay Area to pre-Hispanic fare. Popular menu items include wax moth larvae taquitos ($8); chocolate-covered salted crickets ($5); and toffee mealworms over vanilla ice-cream ($5). The best part is: many of her supplies are relatively inexpensive. She buys the edible bugs from World Ento, an edible insect supplier. “A pound of crickets go for $31,” she says. One of the latest bug-dining locations, Le Festin Nu, opened in October in Paris. The trendy bar/bistro in the 18th arrondissement serves beetles, silk worms, sango worms and giant water bugs. “Most people start with small ones, like the grasshopper or silk worms, but most of them end up eating the 10-centimeter giant water bug,” says chef Elie Daviron, 26. For the even more adventurous gourmands, like Marc Dennis, there’s always the option of cooking the little buggers at home. The painter and art professor hosts bug-dinner parties at his Brooklyn abode. Of course, it isn’t for everyone, as Meeru Dhalwala, chef at Vij’s and Rangoli restaurants, in Vancouver can attest. She introduced her naan cricket pizza a few years ago, and it didn’t catch on. When it comes to easing insects into North American diets, why not? After all, there are plenty of benefits. As for calories, 1 kilogram of grasshoppers has the same amount of calories as 10 hotdogs. These benefits, and others, led the UN Food and Agriculture Organization to release a report in May suggesting that if more people ate insects it could help reduce world hunger. Plus, more than 2 million people worldwide already eat insects on a regular basis, according to Marcel Dicke, professor of entomophagy at Wageningen University in the Netherlands. And that number might be on the rise. Former president Bill Clinton recently handed over $1 million to a startup group that wants to produce insect flour. California-based Tiny Farms sells home bug farms. And Chapul, the world’s first cricket-based energy bar, is being sold worldwide. In the meantime, chew on this: You are actually already eating bugs. For example, the FDA limit for chocolate is 60 insect fragments per 100 grams. Noodles can have up to 225 insect parts per 225 grams. And peanut butter, up to 30 insect parts per 100 grams. When it comes to eating six-legged creatures on purpose, now that’s another thing. “I wouldn’t call it a huge market opportunity in the U.S. right now,” says Vidikan. “But it has potential to break through in bits and pieces.” Especially during cicada season in D.C. where he lives. During the summertime, when they come out in swarms, restaurants have started serving cicada cocktails, cicada tacos and cicada custard. 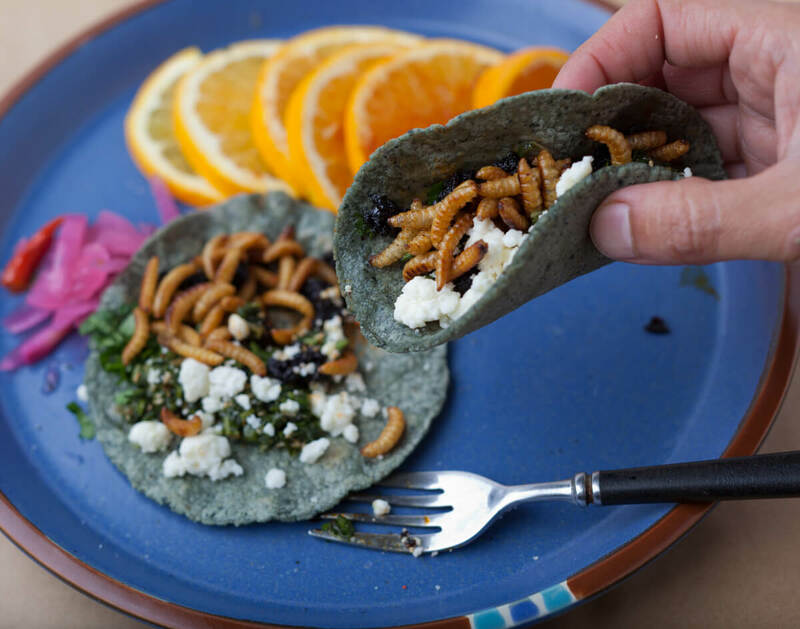 “Of course, there’s still going to be a big difference between Americans accepting cricket tacos on the menu and accepting maggot burgers,” says Vidikan. After all, he says scorpions taste like crab, baked waxworms like pistachios. This begs the question: Will more entomological treats creep onto dinner plates by, let’s say, 2020? There’s certainly a good chance.